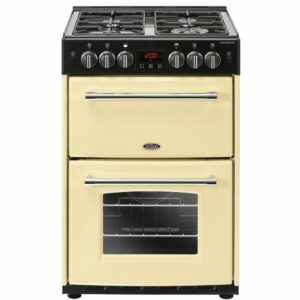 This fabulous Rangemaster gas cooker, in stainless steel with chrome trim, features iconic Rangemaster controls for a really sleek and polished look. The main gas oven has 10 temperature settings and, we love this, a slow cook function. 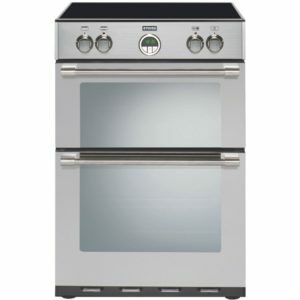 The smaller top oven incorporates a grill and is ideal for cooking smaller quantities and warming. Both ovens are easy to keep spotless with cook and clean oven linings. The gas hob has 4 burners and comes with a sit on griddle. 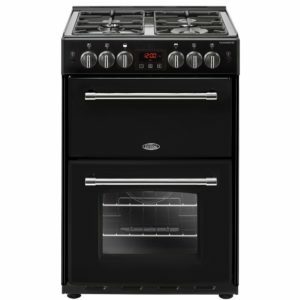 Rangemaster are renowned for their fabulous range cookers and you are benefitting from all their expertise and technology in this field. Rangemaster are giving you a cooker small in size but with all the durability, professionalism and timeless elegance of their bigger models. Lucky you! 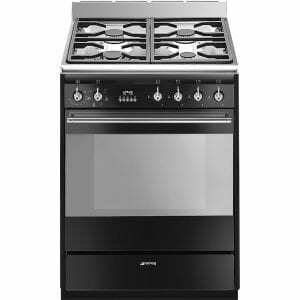 Fabulous Smeg have created an elegant cooker which will be the jewel in the crown in your kitchen! 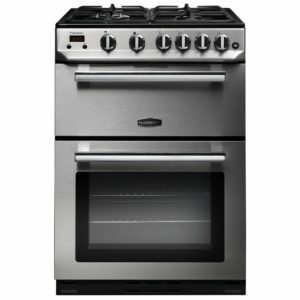 Looking sleek in stainless steel with an oven and 4 gas burners, this cooker will give you the flexibility to cook with ease. A very generous 70 litre oven with 6 cooking functions including Circulaire will give you all the space and flexibility you need. No need to worry about spending ages cleaning it either as the VapourClean function makes cleaning simple. Smeg really have thought of everything, they have even incorporated a storage area below the oven to keep all your cooking paraphernalia in. If you want brilliant cooking with bags of style then look no further, Smeg have delivered! 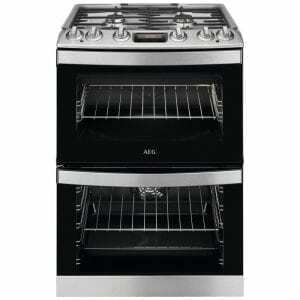 This 60cm wide freestanding cooker from Stoves features electric ovens and a four burner gas hob. Finished in black, it will create a stunning focal point in your kitchen. This cooker also features cast iron pan supports, a flame failure safety device and a defrost function. 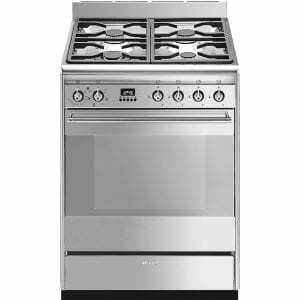 This 60cm wide freestanding cooker from Stoves features electric ovens and a four zone induction hob. Finished in jalopeno red, it will create a stunning focal point in your kitchen. Stoves - Proudly made in Britain since 1920. 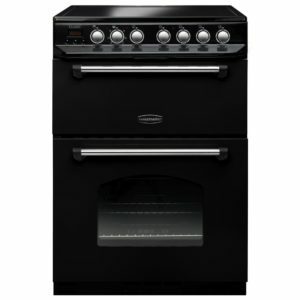 This black 60cm wide freestanding electric cooker features two electric ovens and a four zone induction hob. The main multifunction offers nine different cooking modes making it extremely versatile. The induction hob features touch controls which means the minimalist control panel is much easier to clean. This stunning freestanding cooker from Smeg provides a brilliant feature in your kitchen, with its clean lines and black finish. You are not short of cooking options either, with a generous multifunction main oven offering 70 litres of space and 7 cooking functions. You can choose to grill, or use Circulaire, Smeg's useful cooking function that circulates heat evenly for great cooking results. You can simmer, boil and fry with ease on the 4 burner hob, and Smeg have even included a storage drawer to keep your cooking bits and pieces in when you're finished. There's a Vapour Clean function to take the hassle out of cleaning, as it breaks down food and grease for an easy wipe down. 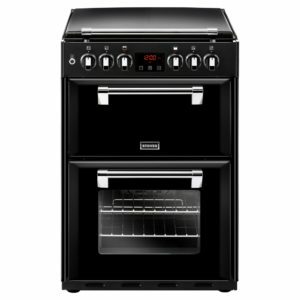 This attractive 60cm wide freestanding cooker from Rangemaster features two electric ovens and a four zone ceramic hob. Finished in black with chrome trim it will create a stunning focal point in your kitchen. 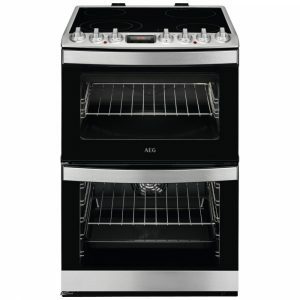 This attractive 60cm wide freestanding cooker from Belling features 2 gas ovens and a four burner gas hob. Finished in a cream it will create a stunning focal point in your kitchen. The energy efficiency rating on this model is A/A and it comes with a one year parts and labour warranty as standard. Stoves - Proudly made in Britain since 1920. 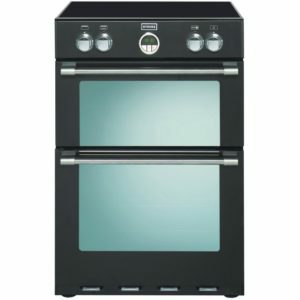 This stainless steel 60cm wide freestanding electric cooker features two electric ovens and a four zone induction hob. The main multifunction oven offers nine different cooking modes making it extremely versatile. The induction hob features touch controls which means the minimalist control panel is much easier to clean. Finished in stainless steel, this brilliant freestanding cooker from AEG offers plenty of space and flexible cooking options, making it perfect for the busy kitchen. With a handy 4 gas burner top, you will be able to create some brilliant dishes with ease. Two generous capacity oven compartments allow you to grill, bake, roast and much more, so you will be able to create a feast for your family! With its handy Cataluxe cleaning, the interior liners absorb grease and as they heat up to 220°C this is broken down. Much better than scrubbing out the inside!